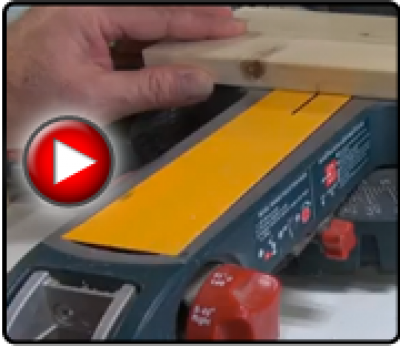 Zero Clearance Tape brings a whole new level of precision to your miter saw. Simply apply over the throat of your saw to eliminate chip out and create an exact reference for line up. Made from durable PVC, they will last for many jobs. I always see this in reference to miter saws. But is there anything precluding this from being used on a table saw? It can be used with a table saw. Here is a link to a video. I would like to try on my large tile saw but needs to be about 3" wide and just a little thicker/stiffer. As far as thicker or stiffer you can simply double or triple it up. As far as width we can sell a 3” wide EZ Stripe but not in less than 25-foot rolls. But if you call in we can do a custom order of 6 to 10 ft of 5 foot wide and you can cut it down from there! Please contact info@fastcap.com or 888-443-3748. Is there a big difference between frog tape or gorilla tape and how easy is it removed from your saw? Yes, our adhesive is MUCH better than Frog Tape and even stronger than Gorilla Tape. The material itself is also MUCH thicker (necessary for preventing blow-out), so it is very easy to peel the material itself off, but it may leave some adhesive residue. This can be cleaned with lacquer thinner, acetone, Goof Off, etc. 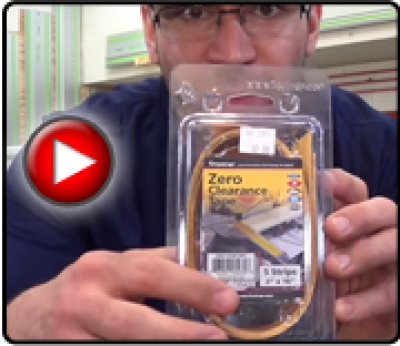 "Zero Clearance Tape" Wally Marshall on 01/21/2017 17:52 Review: Another amazing product. took all of 45 seconds to install. End result is a safer work area, as the small pieces no longer fall into the groove of the miter saw. 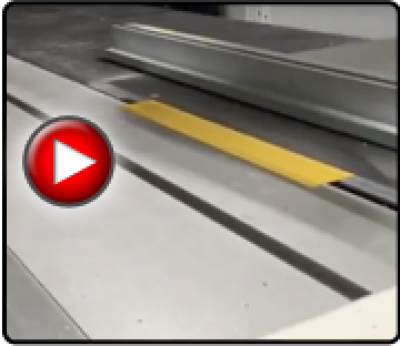 It is now very easy to line up the blade with the cut line, saves time. Just another outstanding Fast cap product. "Makes a cheap saw usable" Dave McGhee on 06/19/2015 06:50 Review: I'm a hobbyist woodworker on a shoestring budget who dreams of someday having a Kapex miter saw in my shop. But for now I have to settle for my 10" sliding miter saw from Harbor Freight. Yeah I know I could get better results from a hand saw or just break the board in two, but this is what I have to work with on my budget. Aside from throwing away the stock blade and putting on a new thin kerf 80 tooth blade I was still getting chipout. So I picked up a package of the Zero Clearance Tape at my local woodworking store and made my saw usable. I couldn't believe the different a piece of pvc tape could make. Together with the new quality blade and the Zero Clearance Tape I have made the crappiest saw actually usable. The chipout is gone, and the cut is smooth. I even have a reference point to line my work up with since my saw does not have a laser. Just add the tape, make a cut and now I have an exact reference of where the blade will be. And the price is awesome, 5 tapes for $5 bucks. I highly recommend you try this product if you are getting tear out. I have a Porter Cable table saw that had a weird plate that I have placed a Zero Clearance Tape over to keep the small stuff from falling through during cuts. Works nice, but I needed to sand the edges of the tape to keep the board from catching, but I think this is going to work just fine over time. One of these days I'll have a better saw but I know this product will be on that saw for sure. Thank you Fastcap for a great easy solution to my budget woes. This woodworker is a happy customer. "100 times easier" Rich McCabe on 10/24/2014 08:29 Review: One thing I wanted to mention having a new Kapex saw. I THOUGHT I had my laser alignment pretty close. The zero clearance tape showed me how far off I really was and made the actual alignment 100 times easier !